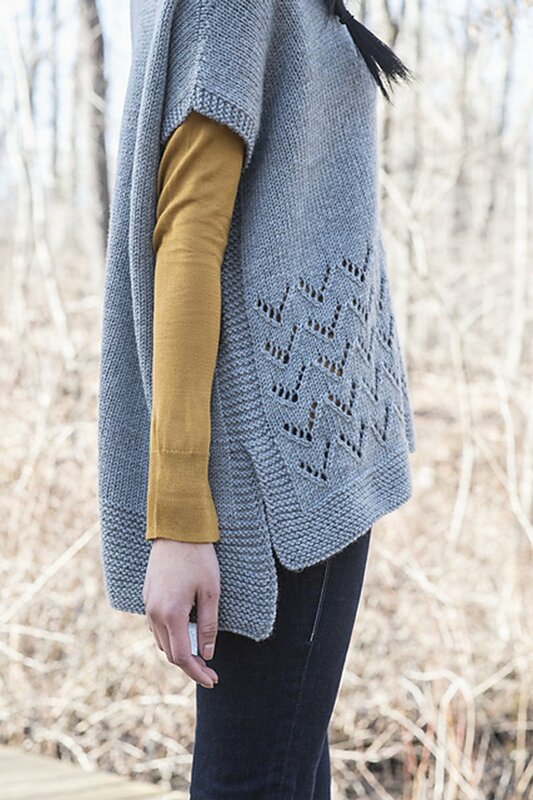 Knit seamlessly from the bottom up, Elizabeth Smith's oversized poncho features a simple lace repeat to add visual interest to a cozy layering garment. Sizes: Directions are for women's size Small/Medium. Changes for sizes Large/X-Large and 2X/3X are in parentheses. Shown in size S/M. To Fit Bust Size: [32 to 40]([42 to 50]-[52 to 60])"
Front/Back Width - 28.25 (30.75-33.5)"
Front Length - 25.75 (26.75-27.75)"
Back Length - 27.75 (28.75-29.75)"
Note: This garment was designed with considerable positive ease. Choose a size based on the "To Fit Bust Size" measurements. Berroco Portfolio Vol. 6 Patterns - Deauville Shawl - PDF DOWNLOAD is a similar pattern: 18 (4.5 sts. / inch) finished gauge, shawls, wraps, ponchos garment, for women, worsted (19-20 sts/4 in) yarn gauge, and berroco ultra wool suggested yarn. You may also like Taiga Hilliard Designs Patterns - Sahaille Falls - PDF DOWNLOAD, which is another similar pattern: 18 (4.5 sts. / inch) finished gauge, shawls, wraps, ponchos garment, for women, and worsted (19-20 sts/4 in) yarn gauge. Hopefully our suggested yarn options for Stanza Coat - PDF DOWNLOAD can help you come up with your next exciting new project idea!